Joseph Jean-Baptist Laurent Arban was born in Lyon, France on February 28, 1825. He died in Paris, France, on April 8, 1889. Today he is known for his trumpet and cornet method book. This book is often refered to as "the Arban" and some even call it the "trumpet bible". There are few good sources about Arban available. Jean Pierre Mathez wrote a biography. His book is currently only in French. The best other source, in my opinion, is an article by Dr. Daniel Kelly, "The Competition Solos of J. B. Arban" (ITG Journal, March 2006 - online here in PDF-format ). Reproduced in this format with the permission of the International Trumpet Guild. For more information about ITG, visit the organization's web site: www.trumpetguild.org A larger part of the text below is quoted from this excellent article. Little is known of Arban prior to his acceptance into Professor Francois Dauverné's trumpet class at the Paris Conservatoire on September 29, 1841, at the age of sixteen. Within nine months he would be allowed to leave the Conservatoire for a journey of six months. The following year Arban would again leave the Conservatoire for professional engagements in London, this time for three months. In 1844 he again asked for a leave to go to London, a three-month engagement that caused him to miss the preliminary round of the concours. Dauverne allowed Arban into the concours that year. Arban won the deuxieme prix (second prize) on December 9, 1844. The following year he again asked for and was granted a leave to travel to London, winning the premier prix upon his return. For the next ten years (1845 - 1855) Arban's career included service in the military and various concert engagements. It is not clear when he began playing the cornet, but by early 1846 his name was already appearing in conjunction with the instrument in concert reviews that extolled his beautiful lyricism and brilliant multiple-tonguing. In 1848 he was promoting the new "compensator" cornet of Adolphe Sax. Arban and Sax would maintain a long working relationship that would later result in his Cornet-Arban. It was also during this time that he began conducting salon and opera orchestras and composed various pieces for the cornet based on operatic and popular themes. 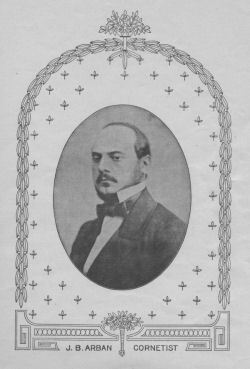 From the summer of 1874 to the autumn of 1880 (between his first and second tenure at the Paris Conservatory) he was travelling, giving concerts and conducting. Little is known about Arban's travels. Arban had four long concert tours in Russia (the summers of 1873 - 1876). In St. Petersburg a special building was constructed for him. It was situated in a garden called "Garden of the Arban Concerts". It is said that Arban wanted to put a stop to the dominance of the German music and musicians and to introduce French music and musicians in Russia. But in spite of this, one of his closest friendship was with the German cornetist Wilhelm Wurm (1826 - 1904). Arban dedicated one of his best pieces, "Caprice et Variations" to Wurm: A mon excellent ami et celebre collegue W. Wurm (for more, see Tarr: East Meets West , page 87-89 and page 127-128). In the summer of 1876, Arban and his orchestra performed in Pavlovsk. He had success by composing and performing a march called Chernyaev March, dedicated to a Russian general. His grand method was written while he was the professor there (in 1864). In 1868 Arban was still teaching saxhorn at the Ecole Militaire. He was at the height of his fame when he petitioned the Conservatoire to establish a cornet class. The cornet was already recognized as a versatile solo instrument and quite popular with audiences. Consequently, there was no lack of music that included it either as a solo instrument. It was most often used as a secondary instrument by trumpeters, trombonists, or French horn players. "It is a fact that today hardly anybody plays the trumpet any more and that the provincial theaters — and even those in Paris — no longer have artists playing this instrument... it is generally known that one can be an excellent trumpeter and yet starve to death, whilst everybody can live comfortably by playing the cornet..."
In January 1869, the cornet class was installed at the Conservatoire, but not quite as Arban had intended. Instead of combining the trumpet and cornet classes, Auber decided to keep the classes separate. He named Arban the professor of the new cornet class and a former classmate of Arban's, Jules Cercilier, as the new professor of the trumpet class, replacing their former teacher Dauverne, who had already decided to retire later that year. For the next four years (1869 — 1873), Arban tried to balance his duties at the Conservatoire with his performing and conducting careers. On at least three occasions he was granted leaves of absence to conduct in St. Petersburg and Povlovsk. Each time, his request was received with increasing acrimony from the Director and government officials, who finally in May 1873 warned Arban that he was not to be granted any more leaves. In April 1874 Arban was again invited to conduct in St. Petersburg and requested another leave, which was denied. Arban reluctantly resigned his post at the Conservatoire. By late 1880 Arban was reinstated and began his second tenure at the Conservatoire, a period in which he devoted himself to his teaching and the improvement of the cornet. It was first published in Paris during the year of 1864. About Arban *) Note: The info about Arban's appointment to the Paris Conservatoire is incorrect in this text. See above. Arban was a significant innovator for the instrument. In 1846, he worked for Adolphe Sax, to whom he gave advice about production of his Saxhorns. Arban demonstrated the "cornet compensateur" of Adolph Sax in 1848, as well. While a cornet professor at the Paris Conservatory in 1880, Arban developed a new model cornet and had it patented in 1883 as the "cornet Arban". A year after its patent, he announced that it could be legally copied by anyone, and Antoine Courtois did build the "cornet Arban" at a later date and a mouthpiece named after him as well, the "embouchure Arban-Courtois." The Courtois-Arban cornet had an interesting and unique appearance. The leadpipe curved, as usual, back to the player before entering the third valve casing, but made an additional curve through the loop of the third valve slide before entering the third valve. In 1886, he tried to make his "nouveau cornet-Arban" required at the Conservatory, but it was rejected. Between the years of 1883 and 1888, Arban experimented with improving the construction of the cornet, and after 1885, Arban collaborated with L. Bouvet, a civil engineer, in making brass instruments. They patented an "Arban-Bouvet cornet" in 1885 and had two improved patents for the same instrument in 1888, one registered in Great Britain and one in France. The "Arban & Bouvet" company was officially established in 1889 (and apparently for one year only) so they could display instruments at the Paris Exposition of the same year. François Millereau’s firm produced their instruments. Millereau was active in Paris from 1861 until 1931, when H. Selmer bought out the ailing company, using Millereau’s name on instruments until c1938. François Sudre, an apprentice working for E. Daniel’s firm in Marseille, built a compensating valve for brass instruments in 1884, the "Arban-compensateur". Monsieur Arban apparently made a phonograph-cylinder recording for the Edison Co. shortly before his death. Perhaps some day the record(s) will turn up? Did Arban have "great chops"? By today’s professional standards, I don’t think that Arban had what could be called “great” chops. He was an important pioneer of the cornet and a prominent solo artist…. In examining Arban’s method and solos, however, we find high C the highest note written…. He has few pedagogical insights into the actual techniques of playing and he gives little advice, or even emphasis, on embouchure development. Until Arbans recording(s) turn up, we will not know how he would have compared to later cornetists like Jules Levy, Bohumir Kryl, Herbert L. Clarke and George Swift. What we can see in methods by some of these later players are a range extending that of Arban. Levy’s book from 1895 goes to G above high C and uses pedal tones (Exercise 302). Clarke gives one example of a 3 octave chromatic scale up to high G, that he used play 4 times in a row (page 53 in Elementary Studies). On the same page, he also shows the extended range of the cornet up to double high C.
I would beg to differ with Dave Hickman's assessment of Arban as a teacher; after all, several famous musicians emanated from his class, and as far as the technical difficulty and range of his solos are concerned, certainly they represented the pinnacle of the art at the time. It gives a false picture if one tries to look back at his achievement from a modern point of view, when "double high C" is a pitch achieved by relatively many.